It has been an extraordinary few weeks in ways happy, joyful, excruciatingly sad and also mundane. Two weeks ago yesterday was the sudden and unbelievably speedy death of a long-time acquaintance, a good, good woman who I always liked in a deep way, and who in much more recent years became the partner of a closer friend. G’s death– rocked my partner’s and my world into stunned heartbreak. Last week was the second half of a week of Shiva (the observance of a week-long period of mourning), and saying Kaddish (the Jewish prayer of mourning), for the woman who died and of rolling up our sleeves and doing things that were needed– particularly for L, the surviving partner. My partner and I were both profoundly saddened and scared by this death– and turned both inward and outward– in our sadness. We stayed especially close to each other and to others too. There are many things I am not good at, but one thing I am good at is knowing who is the clearest thinker in a given situation and knowing how to follow the lead of someone who is doing the right thing. My working class partner is amazing at knowing how to roll up her sleeves and do the work that needs to be done. She does this often and without fanfare or expectation of thanks (something that she can and often does overdo, to her own detriment) but I always follow her lead when she is doing the hard work and the hard work is the right thing to be doing. So we sat Shiva and then visited with people and then we did dishes, packed up food, rearranged the refridgerator, the furniture, carried out trash and recycling and went home. There is nothing quite like doing dishes and cleaning someone else’s kitchen in the face of a death– and I mean this, without the slightest bit of irony. On the more happy side of the ledger–one night I brought my daughter with me to Shiva. She was understandably a little afraid to be there with all these grieving adults, but she did something at the Shiva for my friend, the surviving partner of our lost friend– that touched me so deeply and made me smile, I kvelled inside and a little bit outwardly too– my big-hearted, big girl/little girl. So we wrapped them all up and packed them all up and sent them off to her as yet unmet sister. Sister’s mom called me the other night either in tears or nearly in tears– I could not tell. She said, “your daughter has a heart of gold. It was like opening a box full of love.” What could be more reassuring for a mom (this mom, me), than to hear another woman talk about her daughter that way? She is right, and nothing, really, nothing could be more reassuring. And finally, my daughter had an unusually busy weekend with a Friday afternoon middle school dance, a Friday overnight at our synagogue and a day full of activities at the synagogue on Saturday, a sleepover with a friend of hers at our home when she returned Saturday night and then off to Girl Scouts for several hours on Sunday, so I barely saw her. I miss her when she is gone and I am slowly getting my mind around the idea of returning to doing certain things I love and enjoy that have not so much been part of my child-raising years. My partner and I both had busy weekends and not mostly together. But we made it a priority to take a long, late afternoon walk together on the closed-on-weekends road in our wonderful, large city park. On our walk we came across this, the kind thought, the imagination of some other thoughtful walker, a message to us and all others passing by– which made me so happy– the finder of a lost red fleece glove stopping to send us all this word of reassurance. 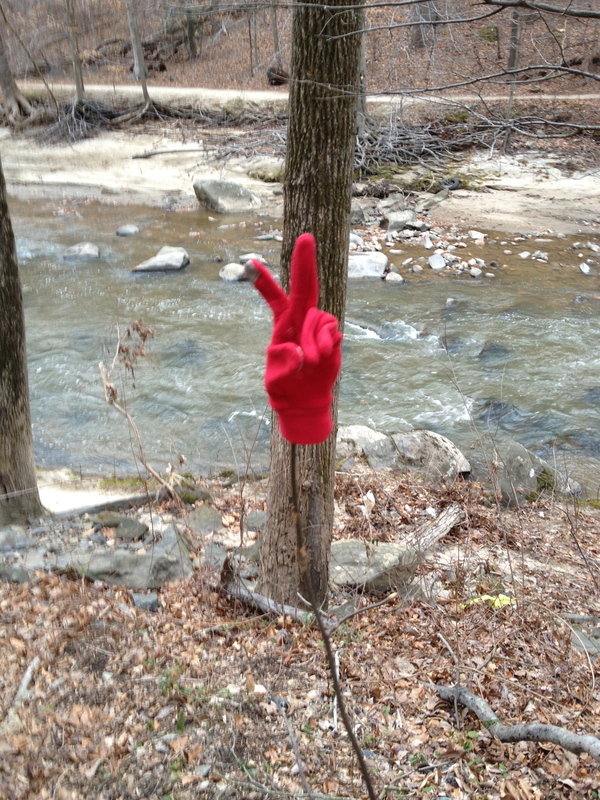 Peace sign, red fleece glove on sapling, February 10, 2013.